Heat oven to 350F. Put a large pot of salted water to boil. While water is heating, make the cheese sauce. In a medium saucepan, heat the butter and flour, whisking until smooth and bubbly to make a roux. Cook on medium heat 2 minutes to cook the flour. Slowly, whisking constantly, add the milk. Reduce heat to medium and cook, stirring, until mixture is thickened. Remove from the heat and add the Italian seasoning, cheeses, salt, pepper, dijon, ham, and peas. Add the gnocchi to the boiling water and cook according to package directions (until they float to the top). Drain and toss gently into the cheese sauce. Pour all into a 2-qt casserole dish. In a small bowl, combine the panko and olive oil. 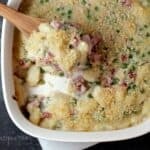 Sprinkle over the gnocchi mac 'n cheese. Put casserole in the oven to bake, uncovered, 35 minutes at 350F or until bubbly and lightly browned. Serves 4.